The Automotive, truck and heavy equipment industries demand critical tolerances with faultless repeatability and reliability. 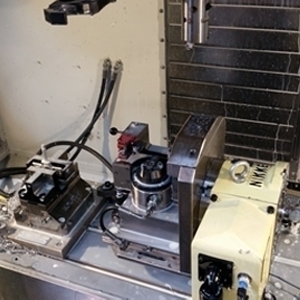 In an age where cost-per-part is being driven down by global competition, automotive companies are looking to specialists like NIKKEN to provide increases in efficiency and productivity, giving them the edge by implementing process improvements. NIKKEN has extensive experience in providing innovative solutions for blue-chip Motor-manufacturers, enabling them to maintain exacting standards whilst drastically reducing cost-per-part and maximising production efficiency. In the exceedingly competitive market of automotive engineering, ZBG Machining have established an outstanding reputation. As part of the wider Schabmüller Group, ZBG Zerspanungstechnik Bruck GmbH are one of Germany’s main Automotive Suppliers. Click "Download File" below to view the full Application story. As a high volume manufacturer of automotive parts our machine uptime is critical to us. 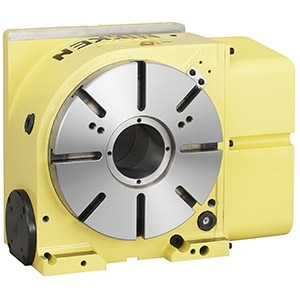 Looking at how we could improve, our analysis and maintenance records showed that many of the machine stoppages were down to Rotary Table issues, in particular the fact that our existing units weren’t maintaining their accuracy and that any slight overload resulted in a costly repair and lengthy breakdown period. A common automotive process demonstration. 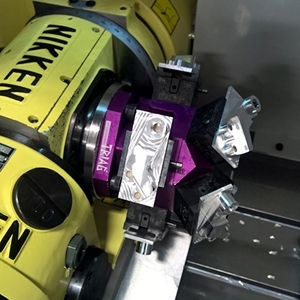 Showcasing the accuracy of the Nikken 5AX350 rotary table integrated into the XR1000 for full 5 axis contouring operations. Our five-axis micro impeller demonstration effectively demonstrates what has become a very popular and widely used application for the Nikken 5AXDD200 direct drive twin axis CNC Rotary Table. 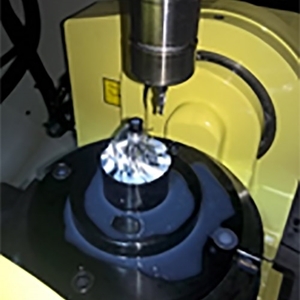 This high-speed compact machine has been fitted with 5AX-100 twin axis rotary table and one single axis CNCZ105 with a trunnion setup. Achieving a total of six axes. 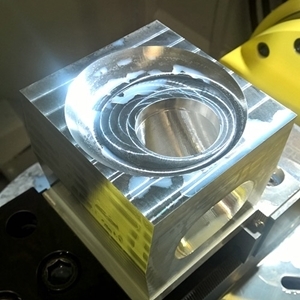 8-sided workholding holds parts up to 30mm wide, a perfect application of a small 5 axis rotary table on a high speed 3-axis machine. 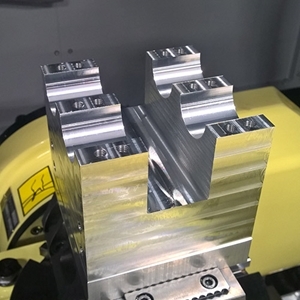 This low-cost approach allows access to five sides of the workpiece at a fraction of the cost of a classic five-axis machine. 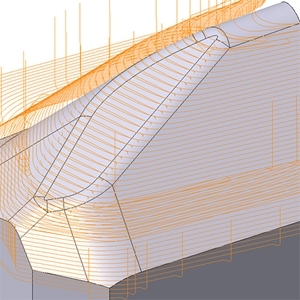 A combination of constant Z roughing, adaptive roughing, core roughing and rest roughing, combined with intelligent ramp, helical and planar entry methods provide the operator with the freedom to produce efficient NC code to suit any component.